Register online to attend the first class by paying Rs. 100/- or contact us for any further information. MPhil English Literature is one of the most popular postgraduate Delhi University course. Students belonging to MA English and other arts subjects often apply for DU MPhil course. However, to qualify for the course, you need to take an entrance exam and interview. Learning Skills offer DU MPhil Entrance exam coaching for students. That prepares you to take up research topic and refine it, and prepare for interview. All classes for DU MPhil Entrance exam coaching are conducted by MPhil pass out teachers. 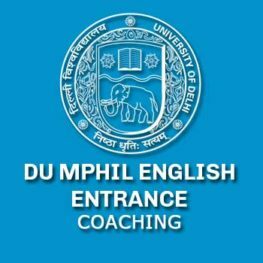 The class limit for DU MPhil English Entrance Exam coaching will be maximum 25 students. Enabling our teachers to deliver quality, and helping students to learn effectively. Learning Skills also provide notes, and sessions on research proposal writing, and interview sessions. DU MPhil English Entrance Exam syllabus coverage will be the core part of the coaching. But, special focus is on helping students improve writing skills, and expand their knowledge. Minimum 55 percent marks in M.A. English in Delhi University. Or any equivalent courses in English literature. Or arts in UGC approved university in India or approved college/institute/university outside India. At the time of admission, candidates have to attach research proposal. And appear for the MPhil English entrance exam. After clearing the entrance exam, selected candidates have to appear for interview. Admissions are open now for DU MPhil Entrance coaching. Apply now.